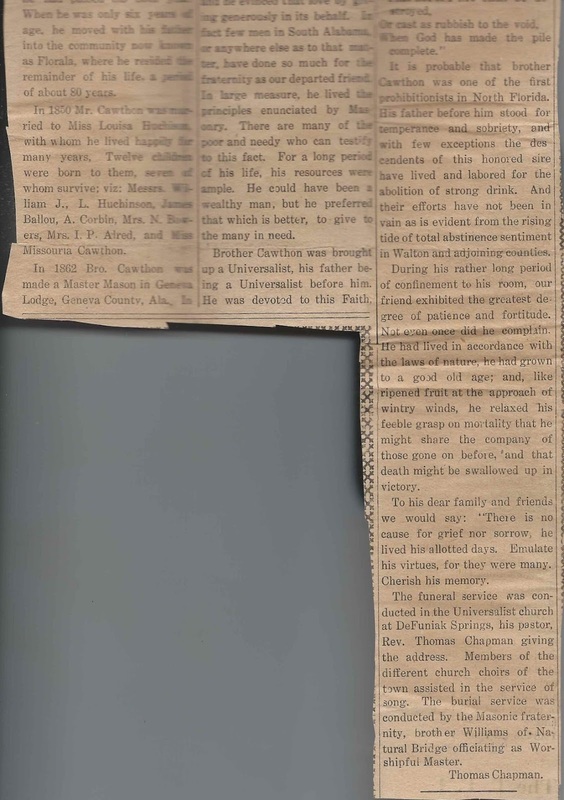 Two obituaries found in a Bible that originally belonged to Josiah Hutchison, father-in-law of the subject of the obituaries, William Josiah Dabney Cawthon, who was the widower of Louisa (Hutchison) Cawthon. Sadly, the Bible either never contained Family Record pages, or they were removed at some point. The only evidence that this was Josiah Hutchison's Bible is on the inside front cover, with the added corroboration of the clippings. Notice in the obituaries below that Hutchinson is also spelled as Huchison and Huchinson. William Josiah Dabney Cawthon was born 20 June 1829, the son of William Thomas Cawthon and his second wife Elizabeth (O'Neal) Cawthon. One obituary has him born in Henry County, Alabama; the other, near Dothan, in Houston County, Alabama. Perhaps the county boundaries had changed. 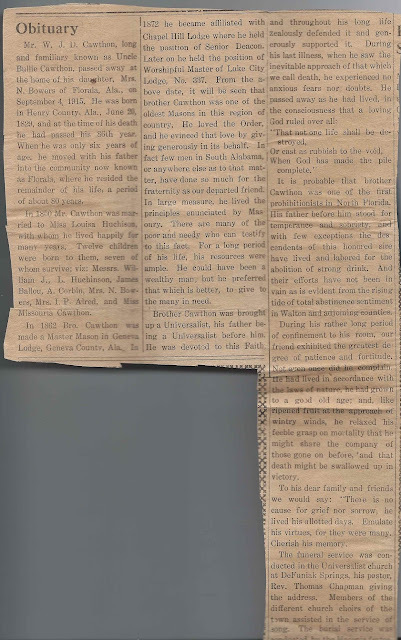 In 1850, according to one of the obituaries, William J. D. Cawthon, "Uncle Bully", married Louisa Hutchison, daughter of Josiah Hutchison and Lorena Ann (Mills) Cawthon, though some online family trees give Louisa's mother as another of Josiah's wives. Mr. W. J. D. Cawthon, long and familiarly known as Uncle Bullie Cawthon, passed away at the home of his daughter, Mrs. N. Bowers of Florala, Ala., on September 4, 1915. He was born in Henry County, Ala., June 20, 1829, and at the time of his death he had passed his 86th year. When he was only six years of age, he moved with his father into the community now known as Florala, where he resided the remainder of his life, a period of about 80 years. In 1850 Mr. Cawthon was married to Miss Louisa Huchison, with whom he lived happily for many years. Twelve children were born to them, seven of whom survive; viz: Messrs. William J., L. Huchinson, James Ballou, A. Corbin, Mrs. N. Bowers, Mrs. I. P. Alred, and Miss Missouria Cawthon. In 1862 Bro. Cawthon was made a Master Mason in Geneva Lodge, Geneva County, Ala. In 1872 he became affiliated with Chapel Hill Lodge where he held the position of Senior Deacon. Later on he held the position of Worshipful Master of Lake City Lodge, No. 337. From the above date, it will be seen that brother Cawthon was one of the oldest Masons in this region of country. He loved the Order, and he evinced that love by giving generously in its behalf. In fact few men in South Alabama, or anywhere else as to that matter, have done so much for the fraternity as our departed friend. In large measure, he lived the principles enunciated by Masonry. There are many of the poor and needy who can testify to this fact. For a long period of his life, his resources were ample. He could have been a wealthy man, but he preferred that which is better, to give to the many in need. It is probable that brother Cawthon was one of the first prohibitionists in North Florida. His father before him stood for temperance and sobriety, and with few exceptions the descendants of this honored sire have lived and labored for the abolition of strong drink. And their efforts have not been in vain as is evident from the rising tide of total abstinence sentiment in Walton and adjoining counties. During his rather long period of confinement to his room, our friend exhibited the greatest degree of patience and fortitude. Not even once did he complain. He had lived in accordance with the laws of nature, he had grown to a good old age; and, like ripened fruit at the approach of wintry winds, he relaxed his feeble grasp on mortality that he might share the company of those gone on before, and that death might be swallowed up in victory. To his dear family and friends we would say: "There is no cause for grief nor sorrow; he lived his allotted days. Emulate his virtues, for they were many. Cherish his memory." The funeral service was conducted in the Universalist church at DeFuniak Springs, his pastor, Rev. Thomas Chapman giving the address. Members of the different church choirs of the town assisted in the service of song. The burial service was conducted by the Masonic fraternity, brother Williams of Natural Bridge officiating as Worshipful Master. It is with a poignant sense of personal loss that the Herald this week records the death of Colonel W. J. D. Cawthon, or "Uncle Bullie", as we who had known him and loved him so long, loved to call him. Col. Cawthon was born 86 years ago, near Dothan, in what is now Houston county, Alabama. In his early youth, he moved to McDade's Pond (Florala), since which time Col. Cawthon has been a prominent figure in the development of West Florida. When the war-whoop of the savage Indian, the howl of the wolf and scarcely less frequent if more dolorous "hoo-hoo" of the owl were the sole evidences of animated life in western Florida, with, perhaps, the hoarse bellow of a "bull gator" in some distant pond as his one and only musical accompaniment, young Cawthon built his home. Those were fearful days, and we of this day and generation are indebted to the accurate memory of Col. Cawthon and a few other of his day and generation for some facts that should give Florida a history peculiarly its own. The capital letters are ours. We use them merely to emphasise [sic] the Colonel's pronunciation. In the death of Col. Cawthon The Herald loses a valued friend and one of its most charitable critics. If you have corrections and/or additions to the information above, please leave a comment or contact me directly. Thanks! I'd be interested in knowing the source of his honorific "Colonel". I descend from his grandfather William Thomas Sr. I have never found just how WJD Cawthon came to be called colonel. His younger brother commanded Company H of the 6th Florida Infantry, so it is possible that this was a legitimate military or militia commission. I have heard that he was called "Uncle Bully" because he had the deep laugh of a bull gator. Glad you happened upon this post! Are there any inscribers in the list, whose pages you'd like to see? My email address is under Inquiries in the right margin. 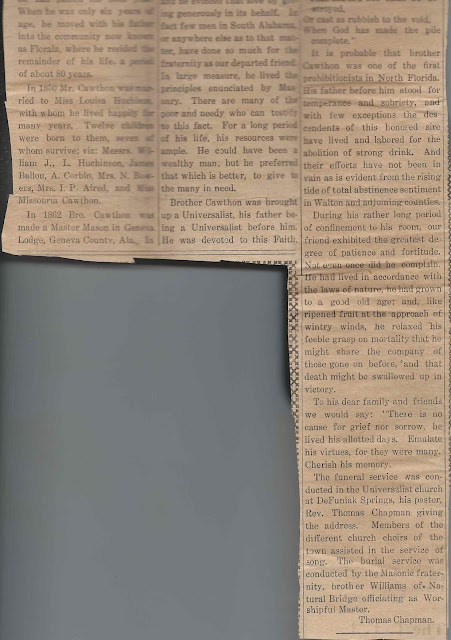 Uncle Bullie Cawthon was my great grandmothers grandfather. Dudley Chipley Cawthon was her father. Thanks for sharing!